Folding @ The Windows Club. Thread: Folding @ The Windows Club. Join our folding@home team and help us cure the worlds diseases. Folding@home uses your PC's spare clock cycles for medical research. Download the client from Folding@home - Download the Folding@home software application and join The Windows Club's team by using the team ID: 180585.
additional programs the client will stop working until its free again. I will follow up on monthly stats with the most active folder. Additional: As well as the CPU client you can also download a GPU client for high end PC's. You may run one or the other or both if you prefer. Last edited by johnny.rotton; 3rd February 2010 at 20:32. I hardly push threads back to the top of the pile unless I feel its in the interest of the group. 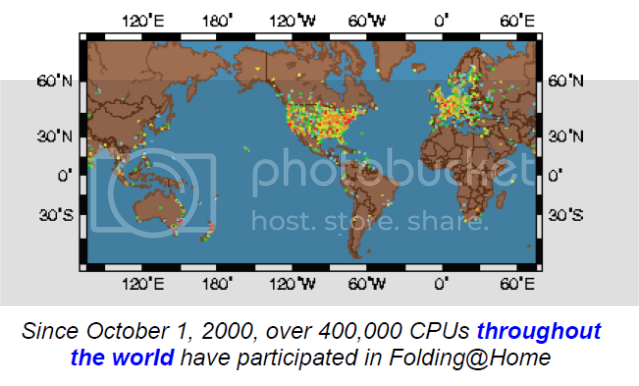 Finally getting the street cred that its creators have so long desired, the multi-platform, distributed computing network known as Folding@Home is to be recognized by Guinness World Records. According to the group, the network is now the most powerful distributed computing cluster in the world. The system, which utilizes the power of more than 670,000 PS3s, PCs, and lawnmower motors to crunch data, has overall computational capabilities greater than a petaflop (which is a ton of flops). The linked consoles tackle a number of tasks, and scientists harnessing the network's power are able to study complex medical problems -- such as Parkinson's and Alzheimer's -- much more quickly. Vijay Pande, Associate Professor of Chemistry at Stanford University and head of the Folding@home project says, "Without them [the Folding@Home users] we would not be able to make the advancements we have made in our studies of several different diseases." Now that Guinness has recognized the system, it can proudly stand next to luminaries such as the man with the longest fingernails, and fastest land animal. Last edited by johnny.rotton; 4th February 2010 at 17:13. Congratulations marcEmarc on completing your first work unit. Looks to be something like SETI@home (searching for ET's) thingy. Noble cause.